This is my second book by Canadian YA writer Courtney Summers and, that’s it: I am a fan. I previously read Some Girls Are and I was totally taken with its unflinching look at what it is to be a teenage girl. It isn’t pretty, people. 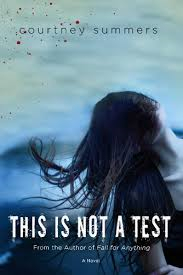 This Is Not A Test has won a slew of awards including being named a 2014 OLA White Pine Honour Book, 2013 ALA/YALSA Top Ten Quick Pick for Reluctant Readers, 2013 ALA/YALSA Best Fiction for Young Adults, and a Kirkus New & Notable Books for Teens: June 2012. Trust me, the book delivers on every possible level. Sloane lives in with her father in Cortege. Her older sister, Lily, has left home and taken a piece of Sloane with her. It won’t take the reader very long to figure out that Sloane’s father is abusive. She tells us he burns the toast because she deserves it and when he reaches out to examine her face, Sloane flinches before she can catch herself. It’s no wonder that Lily has left, but the plan was that they were supposed to go together. Based on the first couple of pages, it would be reasonable to think that This Is Not A Test is a story about abuse, but you’d be so wrong. As Sloane is contemplating the burnt toast and the note her father has written to explain her absence from school, their front door starts to “rattle and shake.” Someone is screaming for help and it is such a creepy event that as Sloane’s father heads to the door to investigate Sloane notes that he hesitates and she has “never seen him hesitate” in her life. When Sloane’s father returns to the kitchen he’s screaming that they have to leave and he’s covered in blood. And then all hell breaks loose, literally. As the days drone on, Sloane and the rest of the trapped teens struggle to stay calm. They jockey for position, alliances are formed and they wonder what has happened to the rest of the world. It all makes for a riveting psychological drama because Summers has an ear for how teens speak and she doesn’t shy away from the fact that this scenario is relentlessly grim. It’s the end of the world as we know it. Except for the feeling fine part. Sloane narrates this story and she is a sympathetic character. Even if she could get back home, what does she have to return to? No one knows about the abuse she suffered and without Lily she feels as though she has very little to live for. Thus, she has nothing to lose. This Is Not A Test is my very first zombie novel. I’ve pretty much avoided them until now because, truthfully, they don’t really interest me all that much. If they were all as good as this one, though, I’d be a fan. Apparently there is an e-sequel available, but truthfully, I thought the ending to This Is Not A Test was pretty damn perfect. This entry was posted in Book Chat and tagged award winner, Canadian, highly recommended, mature teen, YA, zombies by Christie. Bookmark the permalink.